We’re excited to share that earlier this month, we announced the availability of our new SmartLabel solution—allowing consumer product brands to unleash the full power of mass-scale product digitization with GS1 Digital Link and EVRYTHNG digital identities. More than 826 brands that are either already delivering SmartLabel® compliant transparency—or soon will be—can immediately benefit from EVRYTHNG SmartLabel DL. Specifically, if you are a consumer goods company, you can now maximize the value of SmartLabel initiatives, connecting on-pack triggers to Active Digital Identities™ in the cloud that are fully compliant with GS1 standards and Digital Link technology. Lowest cost of ownership of any SmartLabel program with a predictable, annual flat fee. Direct-to-Consumer Experiences—EVRYTHNG SmartLabel DL brings new functionality not available through other SmartLabel programs, allowing you to connect directly with consumers through dynamic, context-based experiences. Real-Time Data Intelligence—Every consumer interaction with a product generates brand insights and permission-based data intelligence to fuel your marketing initiatives. Working closely with the Grocery Manufacturers Association (GMA), we recognized a need to make it easier for brand marketing and compliance managers to set up and manage SmartLabel. Manually inputting product information and managing front-end templates can be time consuming and costly, especially with hundreds or thousands of SKUs. EVRYTHNG set a goal to take all that cost and effort away, which is the announcement we are making today. So with this context, let’s take a deeper dive into the technology. Currently SmartLabel provides consumers a way to digitally access more detailed product information, including ingredients and provenance from 826 brands on more than 36,000 food, beverage, household, pet care and personal care products simply by scanning a QR code on the product’s packaging. But up until now, implementation has not been dynamic, simple or cost-effective. 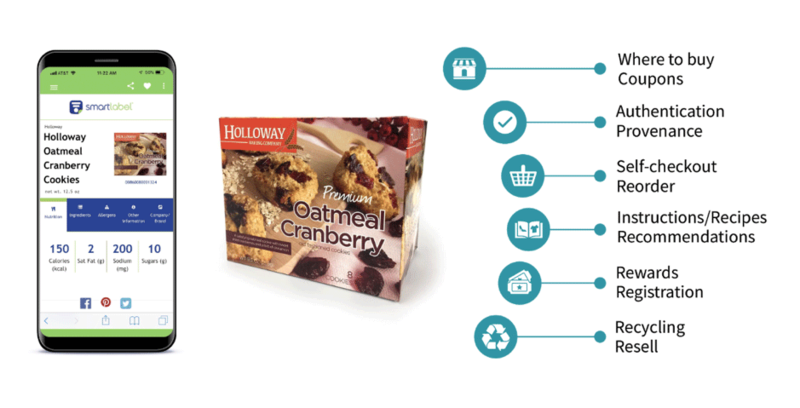 With EVRYTHNG SmartLabel DL, you can deliver SmartLabel compliance for all of your products at scale, while cost-effectively upgrading the capabilities delivered by the same on-pack code to include real-time product lifecycle traceability and context-based direct-to-consumer experiences. So if you are a brand, how do you get product data into the platform? We created a product schema that contains all the necessary custom fields to surface SmartLabel-compliant product information on each of your SmartLabel landing pages. For a small list of products, you can use the new EVRYTHNG CLI tool, a simple tool that allows custom product pages to be created on the EVRYTHNG platform by manually entering all the required SmartLabel data fields. Or for a larger portfolio of products, you can use the EVRYTHNG API, a fast, secure way to automatically upload SmartLabel data from another system. The above flow shows how the process works. And you can see what an actual landing page looks like through our fictitious brand, Holloway Baking Company. How is SmartLabel information displayed for consumer access? EVRYTHNG hosts dynamic SmartLabel landing pages which are quickly and simply populated with product information stored in a brand’s account on the EVRYTHNG platform. Because the pages are dynamic, information can be updated anytime with speed and ease. What kind of experiences or marketing information do consumers receive when they scan a SmartLabel code? Scan the code in store and receive SmartLabel information and a coupon to encourage purchase. Scan the code at home and receive recipes and recommendations for how to use the product and/or suggested future purchases. All content driven from the same GS1-compliant Digital Link QR code on-pack, using software intelligence in the cloud. Each and every scan creates data for unparalleled consumer insights and gives invaluable first-party data for precision marketing. 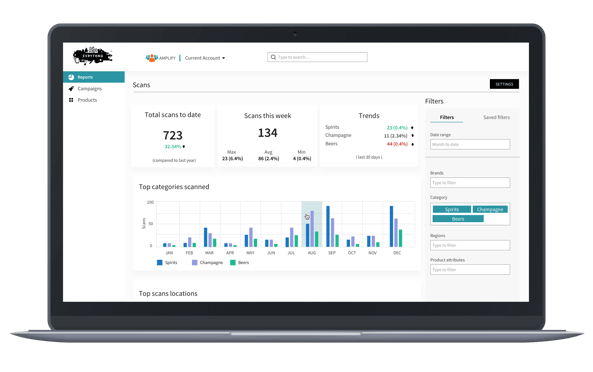 For instance, you can access a wealth of real-time analytics, such as product engagement data, to gain visibility into consumer behaviors and patterns. In turn, this information can help inform future product innovation. GMA predicts that within five years, the SmartLabel initiative will cover 80% of food, beverage, pet care, personal care and household products in the U.S. and Canada. With EVRYTHNG SmartLabel DL, brands can now take SmartLabel initiative investments to a whole new level. Today, customers demand brands not just provide ingredient information, but full product provenance; where and how a product is made, from which raw materials and its journey through the supply chain into the consumer’s hands. Delivering this depth of traceability requires a platform like EVRYTHNG to connect to supply chain systems, blockchains and other product information systems. To get a glimpse of the possibilities, check out this specific use case with our customer Almond. In a world where trust is a precious commodity, this level of transparency will fast become table stakes for all consumer product goods. We’ll be accelerating adoption of our new SmartLabel solution with brands throughout 2019, and have further exciting enhancements planned over the coming months. You can learn more about EVRYTHNG SmartLabel DL here. Curt Schacker is Executive Vice President of Business Development at EVRYTHNG. Curt has spent more than 25 years in Silicon Valley, having held positions at Wind River (Intel), Real-Time Innovations and Arrayent. He was the co-founder and CEO of Embedded Solution Partners.